A sad ending to a hard fought season transpired Saturday night at the Pulmeri Sports Complex for the America East Quarterfinal Match between the University at Albany and the University of New Hampshire men’s soccer teams. The visiting New Hampshire Wildcats 0-0 defeated UAlbany by means of a penalty kick tiebreaker (5-4). “It’s a hard loss for us to accept, it’s always hard when a game has to decided by penalty kicks and unfortunately we came out on the wrong end of the scoring line,” stated a disappointed defender Dom McGarr, UAlbany’s team captain. When UAlbany’s Pomare Te Anau’s shot to tie was saved by the opposing goalkeeper, tied at four penalty kicks apiece, New Hampshire’s Robert Palumbo would convert for a fifth score, ending the game. The match was marked by defensive excellence on both sides, keeping shots few and far between and keeping the ball out of the scoring zone. Neither team was able to find a promising opportunity, forced shots and pedestrian saves characterized offensive attempts of both teams. UAlbany’s goaltender Tim Allen has been impressive in goal this year, recording 91 saves and shutting out two teams during the season. New Hampshire’s goalkeeper, Travis Worra, had been outstanding, totaling five shutouts this season. Out of the 14 total shots on goal, he Wildcats held the advantage with nine shots to the Great Danes’ four. The Danes did not put any shots on goal, however, while New Hampshire forced three saves. New Hampshire also held an advantage on corner kicks, 6-5, although none were converted. The men’s soccer team has been faced with a string of consecutive disappointing seasons, often due to a youthful, unseasoned roster and lack of leadership. What the numbers do not reveal is that their work ethic and perseverance has not gone unnoticed. Last season the Great Danes were predicted to finish eighth in the America East Conference, however they fought hard and survived until the semi-final match. This year, after finishing 6-11 (3-4 in conference play), the Danes were predicted to finish sixth in the group. Decisive wins late in the season allowed the team to clinch a playoff spot, fighting to the quarterfinal match to take a shot at the title. “I think if we were able to create a few more opportunities we could have really taken the game to them, worked to really break down their defense, and put them on their back feet to come away with the win. But in saying that, I’m really proud of the boys, everyone gave it their all but unfortunately it wasn’t enough to come up with a win tonight”, the captain, McGarr, added. Dom McGarr and Jeff Pierre were named the team’s captains at the beginning of this year. Both returning starters, their leadership led the team to a successful second half of the season, fighting back into playoff contention. 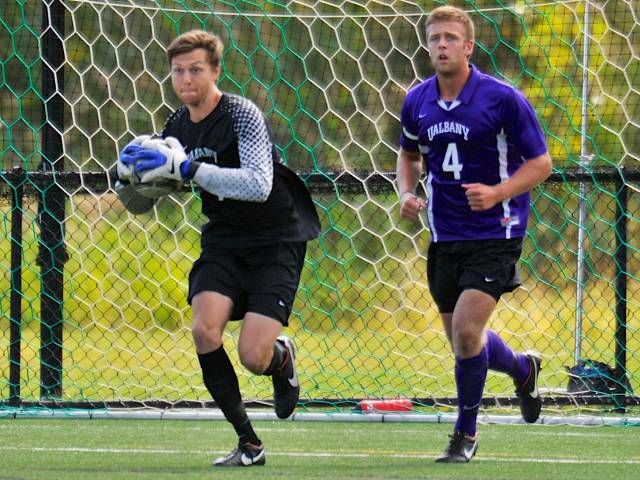 McGarr, only a sophomore, represents the promising future of UAlbany’s men’s soccer team. Two of the Great Danes’ players, Kit Alexieff and Anthony Rozzano, were named America East Conference Rookie of the Week. Rozzano, Philip Persson, and goalkeeper Tim Allen were named to the conference All-Rookie Team. This youthful talent aims to be a foundation to successful future seasons. Great Dane Pomare Te Aneu also performed well during the season, facilitating eight goals from the midfield position. Although his failed penalty shot could have kept UAlbany’s playoff run alive, his hard work and excellent performance all season has been a crucial facet to the playoff run. Coach Trevor Gorman, completing his second year as head coach, has been extremely resourceful of his young players, pushing them through a devastating eight-game losing streak into the conference playoffs. Gorman is respected by the players and, like McGarr, instill hope to a program tainted by defeat. Both men have seen the playoffs twice in both of their years with UAlbany and expect a winning season filled with success in 2013.